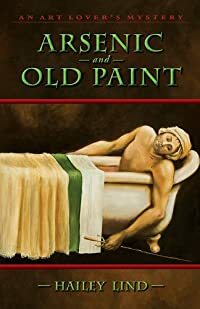 Arsenic and Old Paint by Hailey Lind, a Mysterious Review. Review: Annie Kincaid — ex-forger, now respected restorer — has opened a new business with her sometime partner, sometime nemesis Michael X. Johnson — a former, or so he says, art thief — to do consultative work with the FBI on matters of fine art, and in drawn into a complicated case of insurance fraud in Arsenic and Old Paint, the cleverly titled fourth mystery in this series by Hailey Lind. Annie's latest restoration project is to strip the decaying wallpaper from a room in the Fleming Mansion, an exclusive men's club on Nob Hill, and recreate its Victorian look using paint instead. The wallpaper is based on an original William Morris print, dating back to the 19th century when the mansion was constructed. While at work, a maid finds a man's body in an old fashioned claw-footed tub, a sword protruding from his bony white chest. The murder scene reminds Annie of the painting Death at Marat by Jacques Louis David. Indeed, it seems as if this was intended by the killer, as the man died, not from the sword, but from arsenic poisoning. Identified as Elijah Odibajian, he had been implicated in the sale of a forged painting by Paul Gauguin, the original stolen seven years ago and never recovered. The FBI ask Annie and Michael to look into the cold case, which take the duo through tunnels beneath the streets of Nob Hill and Chinatown, into private homes and secret hideouts, all in search of an answer. Arsenic and Old Paint is a delightful mystery, but so much more. It's an adventure through parts of San Francisco that visitors never see, and an exploration of the dark side of the world of fine art. But all done in a cozy manner, and through the eyes of the competent and smart, stubborn and caring Annie Kincaid. The plot itself may have a few too many elements to it, but that's a minor quibble for this otherwise entertaining mystery. Acknowledgment: Perseverance Press provided a copy of Arsenic and Old Paint for this review.